Nocona General Hospital is a general medical and surgical hospital with 38 beds. It offers a full range of medical treatment and diagnostic services and emergency treatment. The Wellness Center adjacent to the hospital provides a spacious floor plan with easy-to-use cardiovascular equipment and a full set of weights. Complete locker room facilities, including free towel service, showers and day lockers are available for use with no long term contracts or application fees with several different membership plans. The Center also provides a wide range of physical and rehabilitation therapies. Home is the perfect setting for recovery following an illness, accident or surgery. Offering wound care, injections, post-surgery care, medication teaching and assessment of on-going illness, Nocona Hospital Home Health provides nurses on call 24 hours a day, 7 days a week. Outreach Health Services is a leading provider of a variety of health care services and support to individuals, families and the health care community. Located just a few blocks from the Hospital, the Grace Care Center offers 24-hour personal care for those who require rehab services, skilled nursing services, and a wide range of other social services. Yester Year Home specializes specifically in the care of persons with Alzheimer's Disease and related dementias, but is also able to assist with other special care needs. 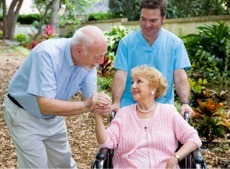 Cherry Street Village provides assisted living services and long-term care facilities.